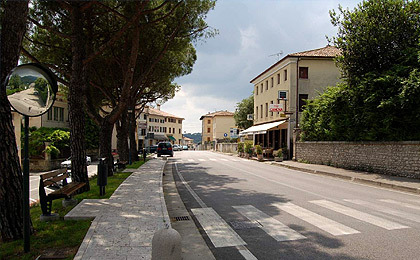 Villa Scalabrini is located in Crespano del Grappa, a town placed just under the slopes of Monte Grappa, 300 m above mean sea level (AMSL). 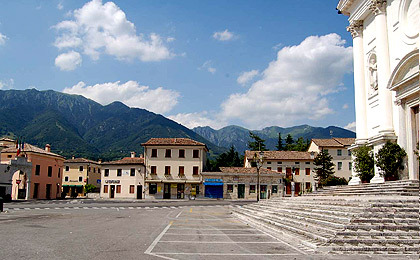 Crespano was first recorded in the 11th century, in the days of the Ezzelinis, and it was well-known for wool production, which had permitted a strong economic growth for the city itself; afterward it became noted as holiday destination for its panoramic exposure and wholesome atmosphere conditions. 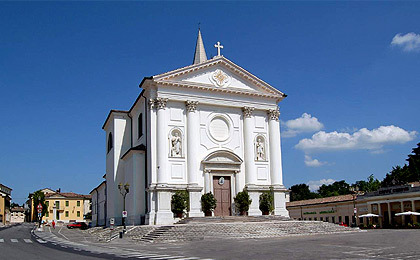 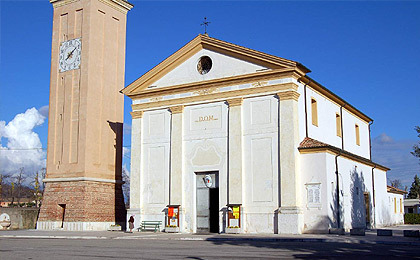 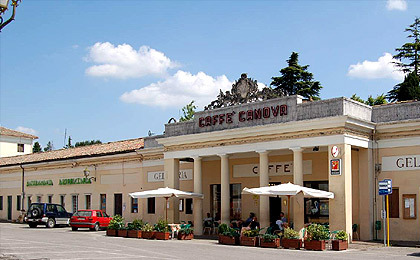 Furthermore, at only 5 km from Crespano del Grappa there is Possagno, Antonio Canova’s home town, where is possible to visit the Museum and Gipsoteca, which preserves some of the sculptor’s famous works, and the Tempio Canoviano where his remains lies. 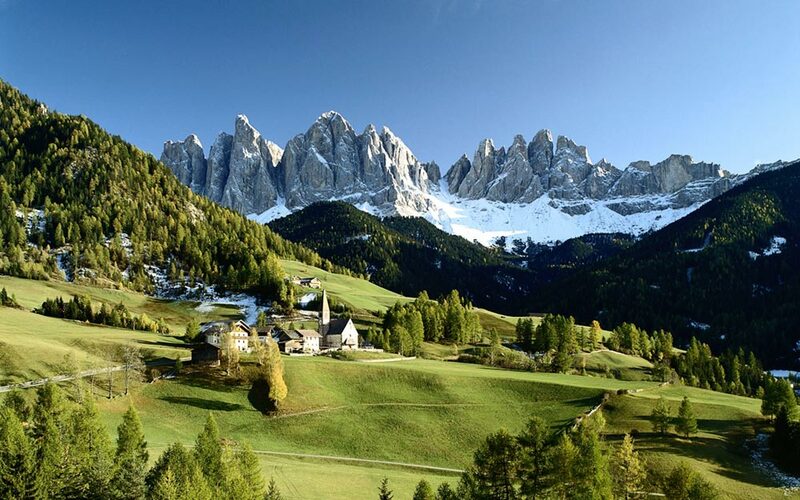 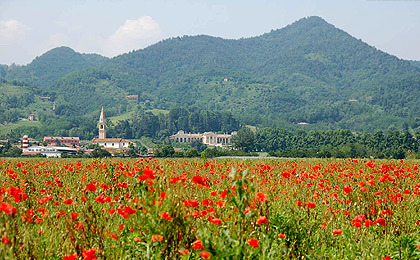 In these beautiful lands is placed Crespano of Grappa, a place rich of nature, culture and sport for your free time. 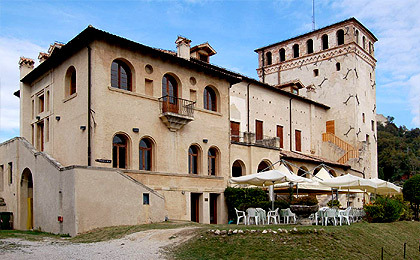 First it was famous in the ‘700s as centre for the wool art, then as place for holidays, thanks to its beautiful panoramic exposure and the climatic salubriousness. 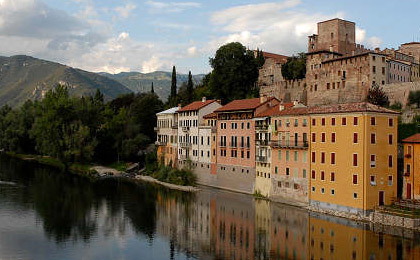 At the base of Grappa Mount and the tableland of Asiago, there is Bassano: the place owes all its charm to the harmony between past and present, through the attention to its own culture (civic collections of the ‘800s, the pictorial production of the Da Pontes and the typographic of the Remondinis, the architecture of the manufactured articles) and art. 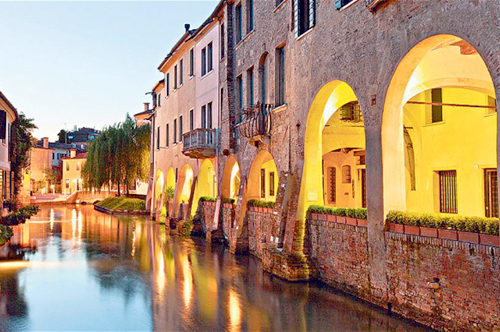 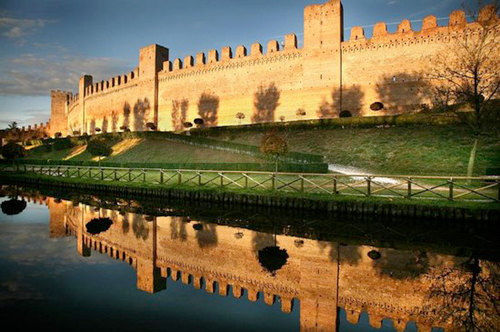 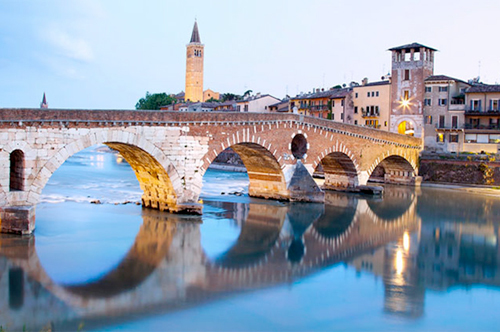 Bassano of Grappa is a city which could wisely join the culture and tradition respect with modern entrepreneurship. 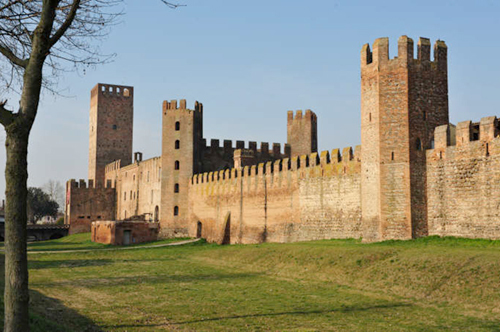 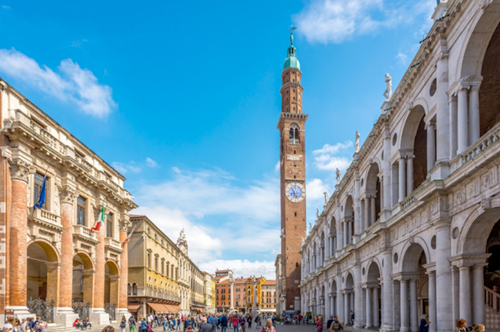 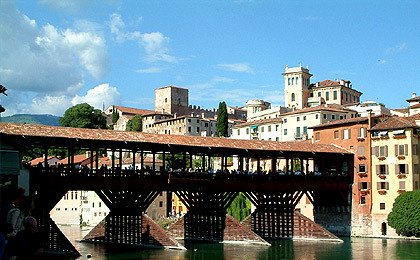 The symbol of Bassano excellence is the Alpines’ Bridge; Bassano joins the Venetian architecture with rich medieval testimonies, surrounded by imposing city walls, which reminds of the roman urban development of the city. 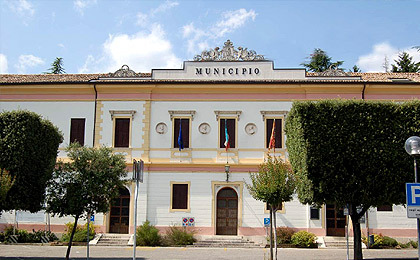 Also the tradition of the selected local D.O.C. 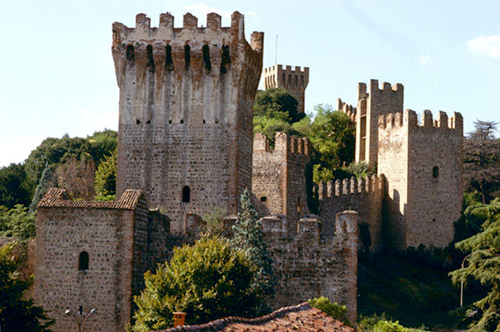 products and the appreciate ceramics, made of Bassano one of the vertexes of international interest. 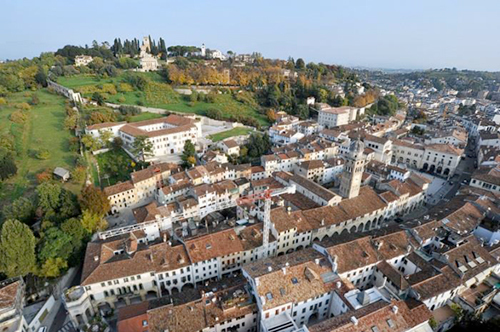 Asolo is a nice medieval city, still preserved in the years. 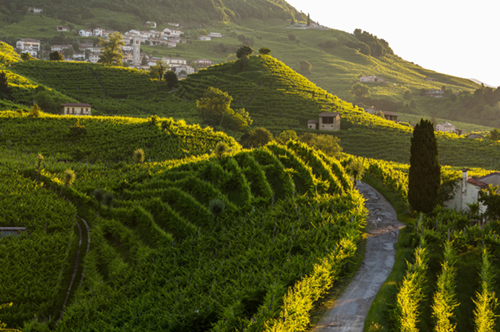 Protected on the hills, it has a Mediterranean microclimate which, together with the romantic landscape, has always attracted lots of important and famous artists, noble and intellectuals. 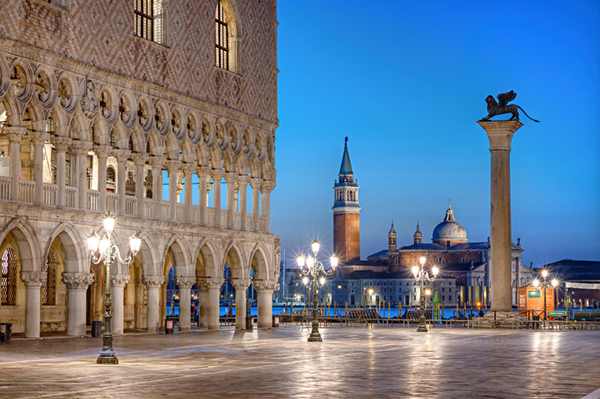 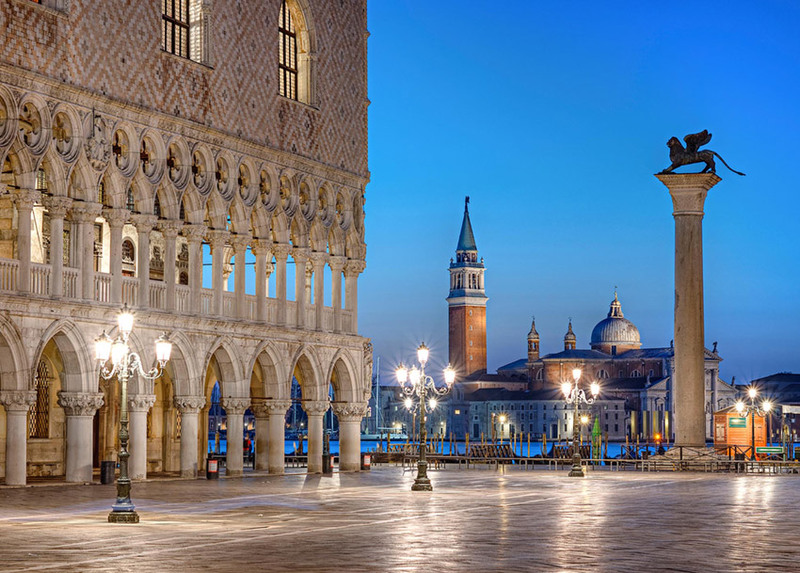 Works of big historic, artistic and cultural value are the palaces, porticos and alleys. 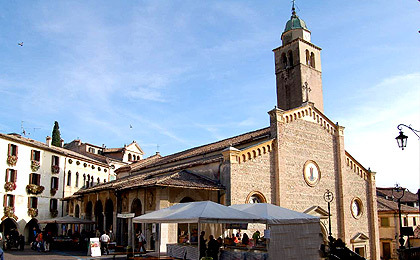 Dominated by the massive shape of the stronghold, Asolo preserves antique churches and rich palaces, among narrow streets and latches, sweet slopes with antique abodes in the green of olive trees and cypresses. 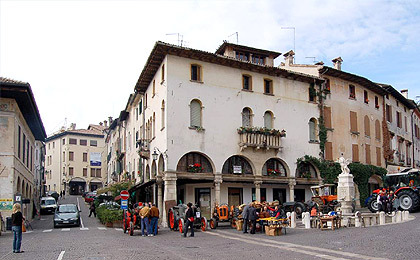 In the middle of the town there is Garibaldi Square, with the ‘500 fountain overhung by the winged lion of S. Marco. 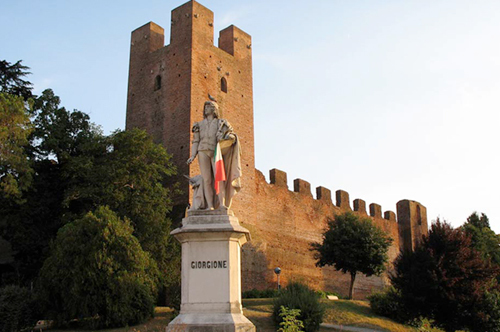 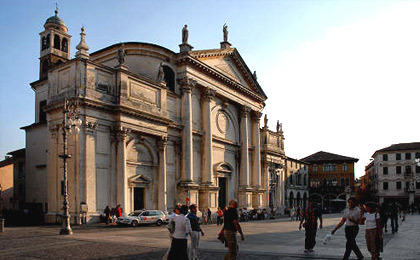 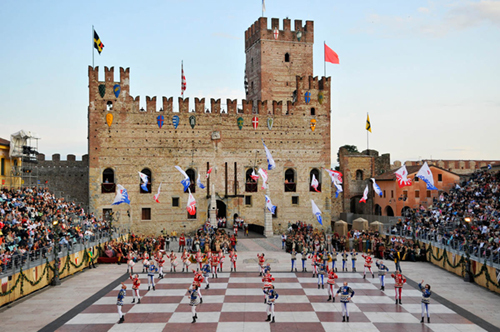 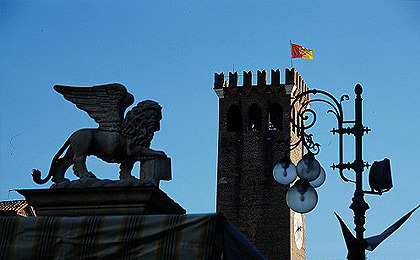 Welcome at Maser, typical and pleasant town of the Area around Treviso, rich of nature, churches and ville patrizie. 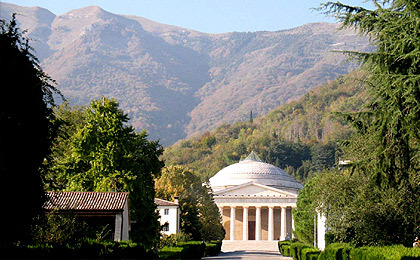 Having a walk among the hills, you can easily find them in the green and flowered landscapes: first among all Villa Barbaro and its little “temple”, masterpiece by Andrea Palladio for Daniele Barbaro, Patriarch of Aquileia. 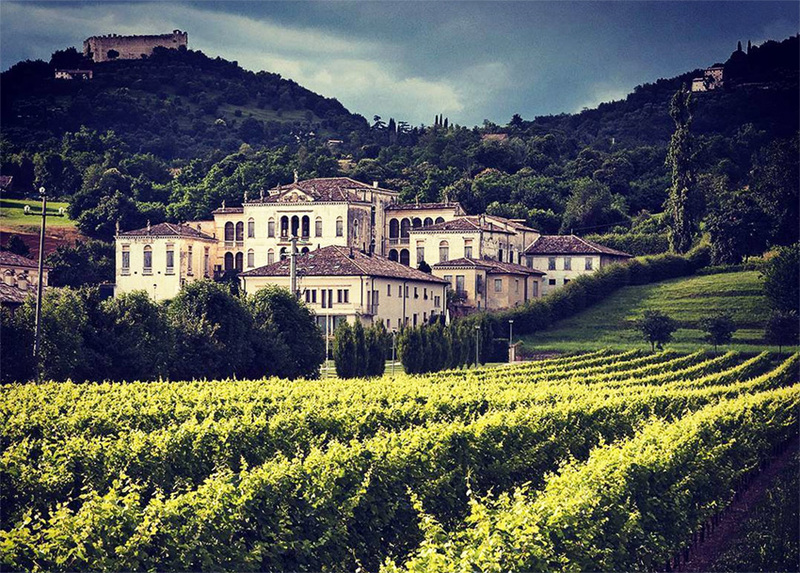 Placed on the top of the hill, the villa has a wide garden which widen the breath and melt it with the nature, which stopped in the time like an immortal poem. 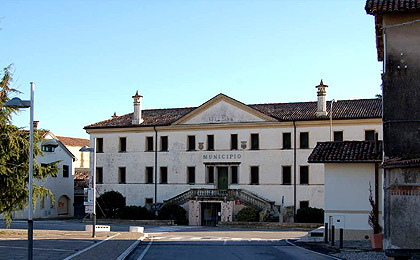 Very active with the production of tiles, Possagno is a really famous town, also thanks to the memory of Antionio Canova. 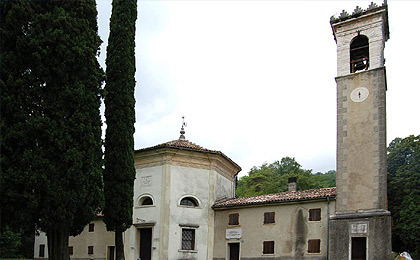 In Possagno in fact there is his native house, preserved unchanged like it was in the last years of his life, with the paintings, incisions, tempers and the documents: an inestimable museum (www.museocanova.it). 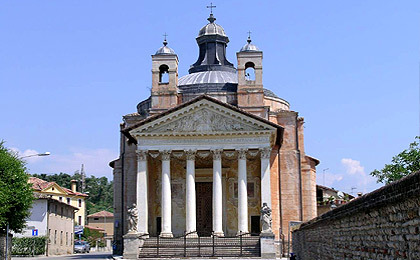 In front of his house, at the end of a slope, there is the imposing Canovian Temple (1819-1830), by himself planned and financed. 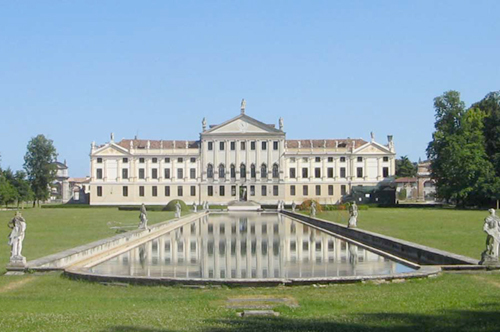 From the house of Canova, you can access to the Gipsotec, which preserves the sketches and casts left by the artist in his study room. 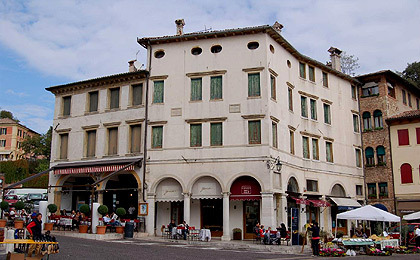 It was widened in 1992, with a new part projected by Carlo Scarpa, it has now three floors. 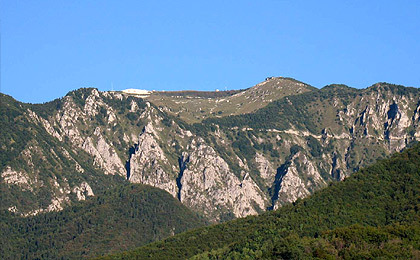 From there you can enter a wide park with long path which lead into a luxuriant vegetation.